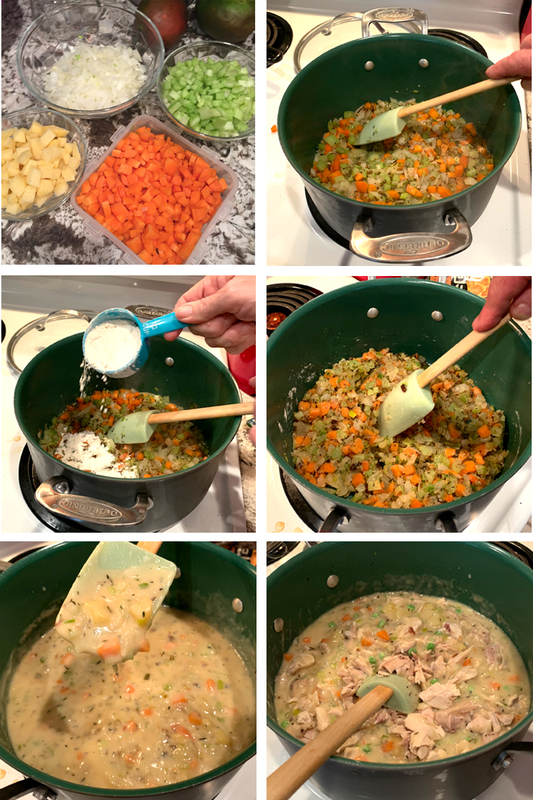 Join us tomorrow evening, Friday February 8th at BlueCashew Kitchen Homestead in Kingston, New York and learn how to make our famous Chicken Pot Pie. It's one of our most popular fall and winter dishes at Bistro-to-Go. Click on the link in the recipe to get your tickets and learn all of Chef Richard Erickson's secrets to this soul-warming favorite. OR enjoy the recipe that we've posted here, from our Feel Good Food Cookbook and share with all of your friends and family. They'll love you for it. To join us at BlueCashew Kitchen Homestead February 8th from 6:00-9:00 for the "Make your own Chicken Pot Pie Class", click on this link or call 845-514-2300. This recipe is fairly straightforward, much like chicken soup, only thicker and chock-full of chicken. (Start from scratch or use leftover roast chicken.) A good homemade stock is the key to creating a rich, flavorful, full-bodied sauce that binds the vegetables and chicken. You may use a store-bought piecrust for the bottom and top, or prepare it in a baking dish using puff pastry for just the top. A large cast-iron skillet instead of a pie pan works well and makes a stunning presentation. There are many steps to this recipe, but if you prepare the stock and chicken the day before and use a prepared pie dough, it comes together quickly. Preheat oven to 375°F. In a large sturdy pot over medium heat, slowly sweat celery, onion, leek, and thyme in butter. Season with salt to taste and cook until vegetables are soft, 10–12 minutes, or more. Add flour, stirring well until butter and flour are thoroughly incorporated, about 2 more minutes. Now add cream and continue stirring to mix well. Remove from the heat. In a separate saucepan, bring chicken stock to a boil, season with a bit of salt, and cook the carrot and root vegetables until they are soft, about 8 minutes. Remove from the heat and, using a slotted spoon or strainer, quickly scoop out cooked vegetables and stir them into the large pot with celery, onion, and leek. Now put the large pot back over low heat and slowly begin ladling in the stock (which will, by now, have been reduced to approximately 4 1/2 cups) into your vegetable mix, stirring well after each addition. The mixture will be extremely thick and messy at first, and as you add more stock it will slowly become a rich, shiny chicken velouté. It should absorb all the stock and have a smooth consistency, a bit like pudding. Continue at a simmer until bubbles start to appear around the edges, 5–10 minutes. It’s done at this point, and the raw flour taste is cooked out. If you feel it’s too thin, simply hold back a bit on the stock as you continue to stir. On the other hand, if you feel it’s too thick, add more stock; if you’ve used up all the stock, a bit of milk will work just fine. Turn heat off and mix in cooked chicken and peas. Give it a taste. I like a bit of black pepper to counteract the sweetness of the vegetables and sauce, so I add some freshly ground pepper in at this point. It’s best to wait until the mix is completely cooled to begin scooping it into the pastry crust; however, if you’re using a baking dish or individual dishes and have only a top crust, do it straight away while the mix is warm. 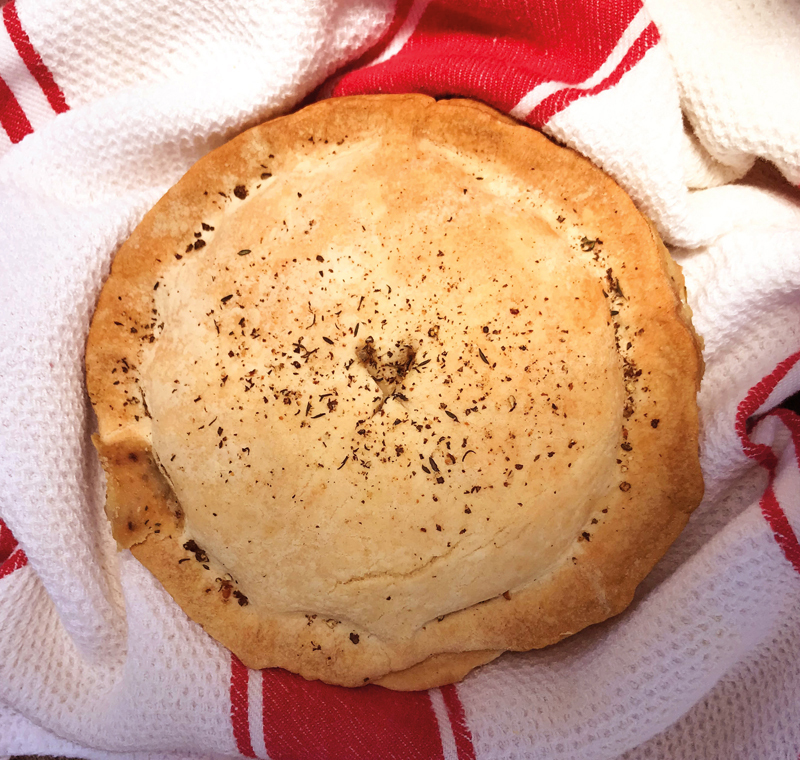 For a classic double-crusted pie, roll your pie dough into two 12" circles, about 1/3" thick. Transfer one into a 9" pie pan, trimming the dough overhang. Add filling and carefully drape the second circle over so there’s 1/2" or so overlapping the edges. Crimp the edges tightly. Brush the surface with the beaten egg, cut a small steam vent in the top, and sprinkle with thyme and a few grinds of pepper. This is a simple, basic crust that will work for almost any tart—sweet or savory. 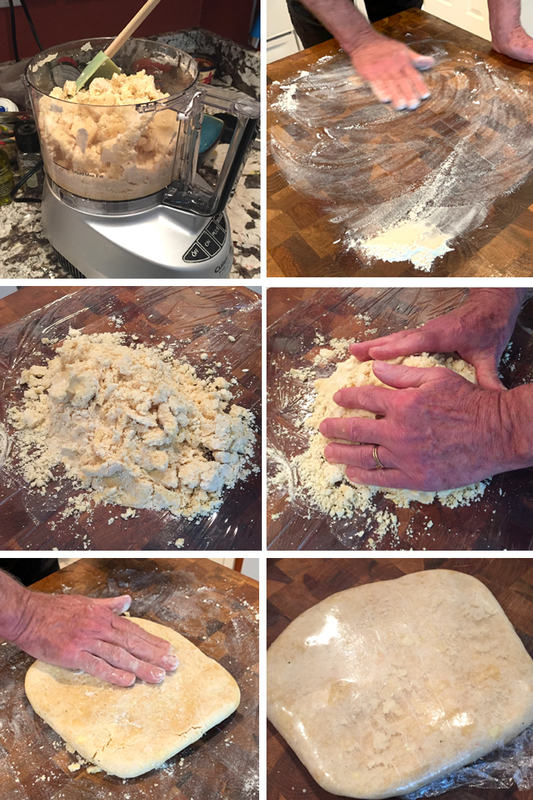 It’s made quickly and easily in a food processor. Place flour, salt, butter and sugar (if using) in the bowl of a food processor and pulse until texture resembles coarse oats. Add egg mixture a bit at a time, pulsing until it starts to pull away from sides of bowl. If this doesn’t happen, add another tablespoon of water. This depends on the flour you’re using and the humidity, especially if it’s a warm day. Place a sheet of plastic wrap on your work surface and turn mixture onto it in one big lump. Fold plastic wrap over to seal and press mixture into a round disk about 1/2" thick. You’ll have more dough than you need for a 10" tart, so save the trimmings in case it doesn’t roll out evenly or for another (smaller) project. It will keep, well-wrapped, for 5 days in the refrigerator or for 2 months in the freezer. Want more delicious dinner recipes? We've got lots of them in our Feel Good Food Cookbook. Get a copy here.